The Other Side blog: Damn You Goblinoid Games!! Please stop making games I want to buy. I am going broke. My wife is tired of seeing "Kickstarter" on the credit card bill too. Speaking of Kickstarters, have you seen the one for Veronica Mars? I never watched the show when it was on and I feel I missed out on something. But anyway they want to make a movie sequel to the show and took to Kickstarter to do it. The results were 100% funding in a few hours and it continues to climb. Check it out. A Kickstarter where the product is actually written BEFORE funding is sought? And a working PDF of the product is made to backers DURING the funding? As a backer of a few "long ago funded, yet not finished writing" KS projects, this is an appreciated development! Damn you, Goblinoid! And you, too, Tim, for bringing it to my attention. *sigh* I don't have the money right now for both, so I guess I'll cancel the Obsidian Portal KS pledge I made and go with this instead. Who is publishing Chill now? And have they republished that one supplement where you got to play the creatures (was it Creature Feature)? That was a lot of fun, and predated White Wolf's games (and even Nightlife) by years. Damn you all...I was trying to cut back on Kickstarters. However, I'd been asked to think about running something Dresden like and I love Mage:the Awakening. However, my players aren't (for the part) the kind who would easily absorb either rules set (or the background in the later case). 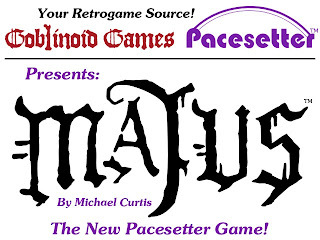 Majus is just what the Doctor ordered. I'm in for all three in pdf and Softcover. Didn't Pacesetter make Chill? If so, please reissue the original! Other World Creations now owns Chill. Chill was owned by Pacesetter but they sold it to Mayfair Games in the 90s. Or it was bought. 3rd Edition Chill was supposed to be done a while back. I was a playtester on it and contributor, but it never saw the light of day. I can't help but wonder if Dan of Earth is working on that Tim and just can't tell us. Right now, Chill is one game where I consider it acceptable to have illicit pdfs. My rule of thumb is "if the rights owner will not make it possible for me to buy a copy and has no plans to do so it's abandoned" (I actually think copyright law should work this way after a given period of time which would solve a lot of the complaints about extension but that's another story). I'd love to have to cross Chill off that list. @Faoladh: I would love to have Nightlife back with a simpler system and the Gargoyle rules from White Wolf magazine incorporated. I think you can still buy Chill at DriveThru. That is where I got mine. Ah, well, there are used copies on Amazon. Though, I wouldn't pay the $200 they want for the basic game. The supplements are much more reasonably priced.